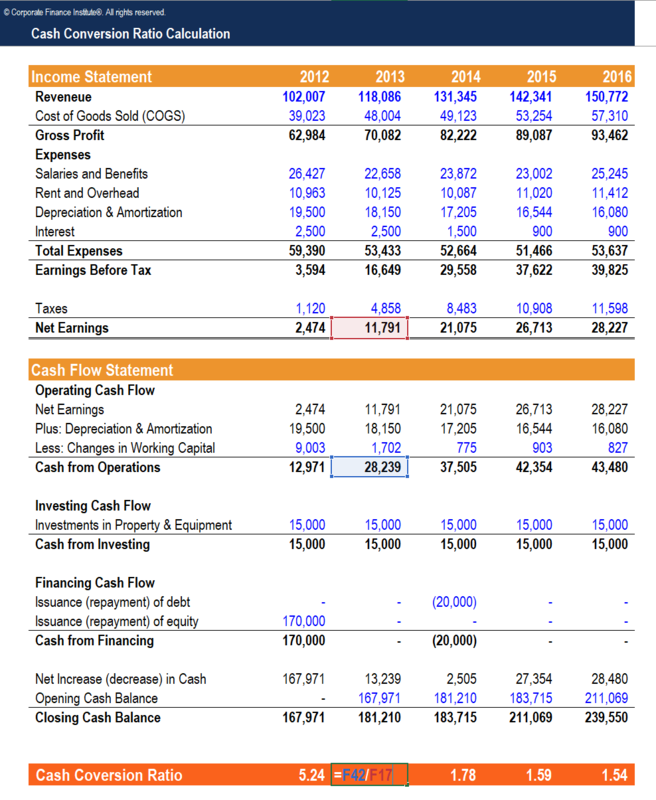 While calculating CCR, cash flow is the center of the equation. It is used to determine all cash generated in a given financial period – often quarterly, or annually depending on the company’s accounting cycles. In this case, we want Cash Flow from Operations, or Free Cash FlowFree Cash Flow (FCF)Free Cash Flow (FCF) measures a company’s ability to produce what investors care most about: cash that's available be distributed in a discretionary way (which is equal to operating cash flow minus capital expenditures). 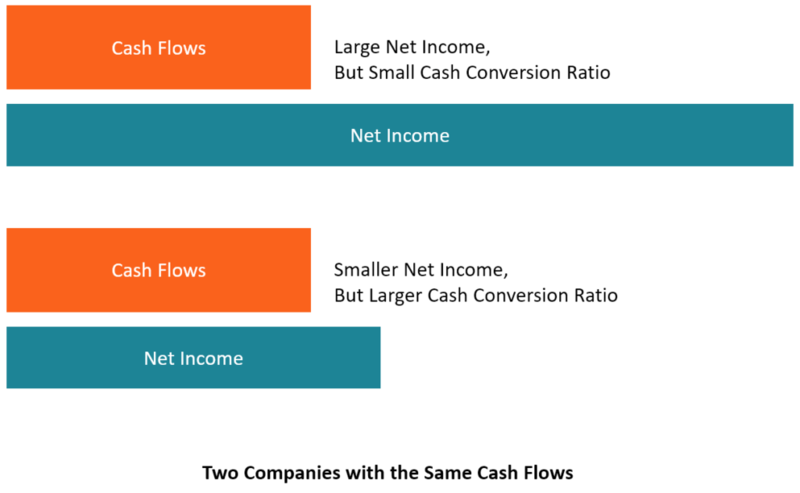 Once cash flow is determined, the next step is dividing it by the net profit. That is the profits after interests, tax, and amortization. Below is the cash conversion ratio formula. The resulting ratio from this calculation can be either a positive value or a negative value. This can be summarized as: if the ratio is anything above 1, it means that the company possesses excellent liquidity, while anything below 1 implies it’s a weak CCR. Anything negative suggests the company is incurring losses. Below are some of the takeaways calculating the Cash Conversion Ratio of a given company. A high cash conversion ratio indicates that the company has excess cash flow compared to its net profit. For mature companies, it is common to see a high CCR because they tend to earn considerably high profits and have accumulated large amount of cash. In contrast, companies in the start-up or growth stage tend to have low or even negative cash flows due to the required amount of capital invested in the business. In early stages, companies often find themselves earning negative profits until they reach a break-even point, thus the CRR of these companies would also be negative or low. While a high CRR could be a good sign for liquidity, having too much excessive cash might imply that the company is not utilizing its resources in the most effective way. The company should consider re-investing in profitable projects or expanding its operations to further enhance the profitability of the business. When the ratio is low or negative, it could be an indication that the company needs to adjust its operations and start figuring which activities are sinking its income, or whether it needs to expand its market share or probably increase sales in favor of revamping cash flows. To investors, what matters is whether a given company is generating enough cash flow to provide a solid return per share. Thus, significant investment opportunities will offer a higher ratio while a weak investment will show a small ratio. However, some companies may dubiously try to alter the ratio, especially the cash flow part, to attract investors. That’s why proper scrutiny of the books of accounts should be conducted first before making an investment decision based on CCR. CCC is used for measuring management effectiveness by determining how fast a company can convert cash inputs into cash flows over a given production and sales period. In portfolio management, it is used to determine the number of the common shares which a company has been receiving at a specific time of conversion of each convertible security. That is the ratio of per value of convertible bond divided by the conversion price of equity. Operating Cash Flow RatioOperating Cash Flow RatioOperating cash flow ratio, a liquidity ratio, is a measure of how well a company can pay off its current liabilities with the cash flow generated from business operations. In other words, operating cash flow ratio shows how much a company earns from its operating activities per dollar of current liabilities.